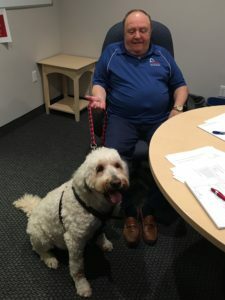 Abel HR CEO Jim Bell Sr. and his dog Cassie in the conference room of Abel HR’s offices. Pets in the office help with stress, morale and employee retention. Pets are essential companions for most of us and have positive effects on health and mental health. Research proves pet friendly workplaces have better morale, reduced stress and increased employee retention. There are many benefits of a pet friendly office for employers. First having pets in the office forces employees to take a much needed breaks and step away from their computer, which has been proven to encourage creativity and improve productivity. Dogs also foster team building as they are natural ice breakers that stimulate conversation. They also improve productivity as employees are willing to stay a few minutes later since their pet is with them and they don’t need to rush home to let them out. Although bring your dog to work day isn’t technically celebrated until the Friday after Father’s Day (so, for this year, that would be June 22), February is the month designated for pet appreciation with National Love Your Pet Day on February 20. We’ve compiled a list of some ways that you can show some love to your four-legged friends while still remaining productive at work. First, run it by your office mates. You never know if Sarah in accounting is allergic to pet dander or if Charlie in sales is deathly afraid of puppies (no matter how cute!). In order for everyone to be comfortable on the big day, everyone has to be on board with the idea. Be prepared! If you’re bringing your pet in, you should have all the items necessary to keep your pet entertained for the day, including a comfy place to sleep, toys, water/food bowl, dog leash (and poop bags! ), and anything else she or he requires to stay happy. Remember to get Fido all spiffed up! He’s meeting your workmates for the first time, so he’ll want to make a good impression by being clean and – perhaps most importantly – healthy and up-to-date on all immunizations. Be prepared to do a little bit of clean up before your pet arrives. If you have a chewer, be sure to stow cords out of paws reach and be prepared to empty and hide your garbage can if you have a pet that likes to dig around! Recognize that not all pets will enjoy a trip to the office, if your dog is not much of a people person, he may find it stressful to meet so many strangers in one day. Also, consider the fact that there may be more than one dog in the building, so make a decision accordingly about whether this is the optimum environment for your dog. If bringing your pet into work isn’t feasible – and for many businesses, it just isn’t – there are still a myriad of ways that you can show some love. Consider hosting a fundraiser for your local pet shelter. Ideas can include a raffle, a bake sale, a sponsored walk or run (extra credit if it’s a pet friendly event) or simply taking a collection in the office. For more ideas, click here. Use the whole month of February or June to collect pet food, toys, new beds and other pet necessities and then take an afternoon to go, as a group, over to the pet shelter and present your goods to the pups in need. Consider sponsoring a kennel or cage at your local shelter – it doesn’t cost much, but is a nice way to show your appreciation for the efforts of your local (and some facilities will even recognize your contribution with a plaque on the kennel and promotion on their websites. For an example of such a program, click here. Abel HR can help your company set up a dog-friendly policy for your office or help you offer pet insurance to your employees. Ask us how.